After leaving Hawaii I headed to Sayulita, Mexico, for my good friends Erica and Brooke's wedding. I'll admit that I was fearing Mexico would be the least green of all my destinations. I knew that I wouldn't be able to drink tap water and have to purchase bottled water (I suppose I could have purchased a portable water filter, but I didn't think it was worth the investment for only 5 days). To lessen our plastic impact as much as possible we purchased the largest containers we could find (6 litres) and carried our usual stainless steel bottles with us during the day. Buying in bulk is always the greenest option as far as packaged foods are concerned, and as an added bonus the Bonafont bottles we purchased were made of 100% recycled materials - not too shabby! and the eco-stats on Bonafont. While inside the small corner store I was pleasantly surprised to find a huge array of organic food products - more than my local Coles - including cereal, tortillas, juice, coffee, milk and a lot of produce. So, good on ya, Sayulita, your organic food choices squashed my belief that this would be the least green portion of my trip (remind yourself why organic is better for the earth in my green wine fling post). Also keeping us sustainable once we arrived was the very walkable town - no driving the entire 5 days we were in town. The 15 minute walk from our apartment to town was also a convenient way to get in some exercise to counteract all the delicious Mexican food and beer we'd been enjoying . . . 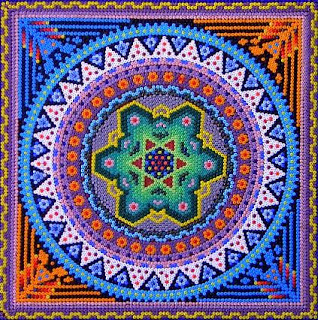 Thanks to some of the other wedding guests we found an art gallery that sold Fair Trade artworks from the local Indigenous community the Huichol people. 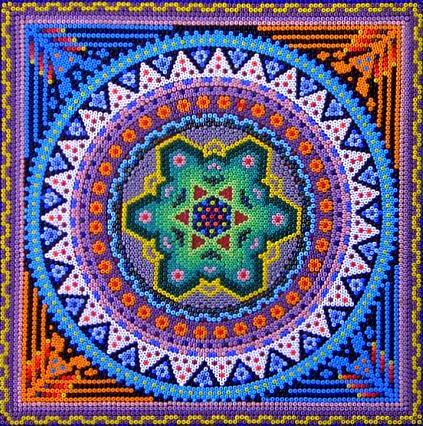 The specialty of the Huichol are intricately designed beaded artworks, and we bought a few souvenirs for ourselves and family members - proceeds benefit The Huichol Center for Cultural Survival. The Mexican beach wedding was unbelievably beautiful, and the gorgeous bride and groom had considered the environment throughout their planning. Nearly all the decorations for the wedding were reusable (and some reused or rented); some of my favourite green things were small terracotta drinking jars that would disintegrate after a couple of days, handmade necklaces for us bridesmaids (I wore my yellow Gorman dress that I purchased on my eco-shopping spree in Melbourne), and cloth napkins made from cloth from Etsy, which have come back to Sydney for future use, and locally-made wooden lanterns that were rented for the evening. A fantastic five days enjoying Sayulita, a fabulous wedding, and a greener week than I'd imagined - adios for now, Mexico, but I hope to be back soon! (and rented) lanterns hanging here.